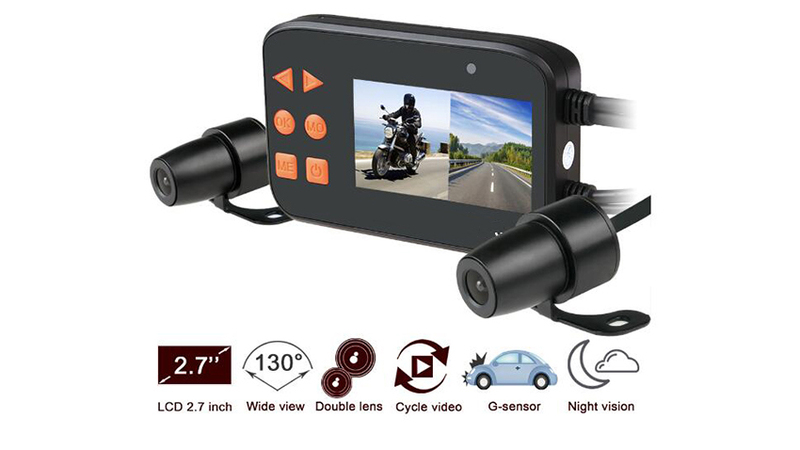 This motorcycle DVR is the ideal solution for any rider looking for a system that records road trips and assists while riding or backing up their bike. The two cameras feature real 1080P high definition and are waterproof. The 120 degree wide angle lens on both cameras ensures excellent visibility without any “fisheye” effect. Both cameras also feature color and nightvision. Cameras can be mounted in a number of different locations on your motorcycle, for example on the engine guard. The image is richly displayed on the system’s small but clearly visible LCD Monitor that can be conveniently attached - e.g. with the included zip ties. The Monitor has an intuitive touch screen and is very easy to use. The integrated recording function itself is equally easy to use: simply put in the SD card and your cameras are ready to capture everything you see. The two cameras make full use of the combined capacity of two separate cameras so as to cover a maximum area. This unit supports up to 128 GB SD card, which means you can record footage for many hours before it automatically loops and overwrites the earlier footage. This unit features reliable and sophisticated technologies. The monitor has the ability to operate in split screen mode, showing both cameras at the same time.The monitor can be controlled via the touch screen or via a wired remote control. This remote also has a microphone built-in for voice prompt commands. The cameras have a CMOS sensor and their sturdy housing offers robust protection. The unit also has a “time-stamp” function so that date and time can be displayed along with the recorded footage. A number of languages are supported, including English, Spanish and French. "I was looking for full coverage or front and back and boy did I get it. Really easy to use menu we great features like when I forgot to pop in my SD card and if warned me it wasn’t recording. Easy to use! Thanks Tadi!!!"